NEW!! Download the .pdf file and print these coloring sets for your personal use! No shipping, no waiting for the mail to arrive! These costumed ladies (and gents) are not JUST for little girls, but are enjoyed by anyone with an interest in fashion, history, and an enjoyment of coloring. Beginning with ancient times and the fashions of the Egyptians, through Victorian, Edwardian, and other Heirloom era dolls and going all the way up through the 1960’s and ’70s, these dolls and their wardrobes are a treat to color. She’s a Wild Western Woman of a colorful nature—though she starts in black and white! We suggest doll coloring sets are be printed on durable white card stock for greater strength, and ease in coloring. My favorite results are with markers, and I prefer Sanford Prismacolors with the double nib felt tip pens, both a fine and a chisel point. They have great colors and are very transparent, along with a high degree of control and color mix-ability. Brought to you by the same company as Sharpie Markers, you can find sets of markers at most office supply and art supply sources. In addition to old style art with actual paint, ink, and other forms of pigment, I also love using technology to color. Here’s a link to a tutorial on using Adobe Photoshop to make beautiful printable full color paper dolls. 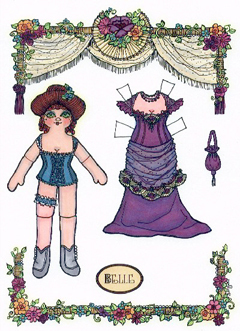 The info is also part of an upcoming book and e-book A Deluxe Heirloom Paper Doll Collection that I am working on for publication this year. Purchase our digital files securely online using PayPal. A link to the file in .PDF form will be sent to your email address, and you can print and color as many times as you like FOR PERSONAL USE ONLY. You will need Acrobat Reader to open the file, and it comes installed in most computers, or you can get it at no cost by clicking the link. Please do not share or sell the file or the printouts. Thank you for respecting artists’ copyrights and supporting personal art.